Had a quick scout around the net, cheapest @ Tesco is £4.97 & Amazon it's £6.97, so thought this looked quite a good buy @ £1.99. 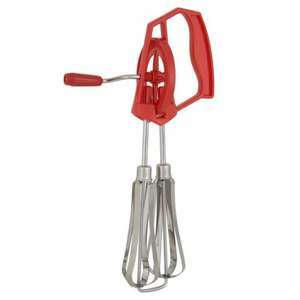 The ASDA Rotary Whisk will make light work of whisking your cake mixes. If you love baking but can never get your cake mixes light and fluffy enough with a bog standard whisk then the rotary whisk is the whisk for you. Simply hold the handle and turn the wheel to activate the whisks. Sorry hun, I bought one of these at the start of the hols to keep madam entertained by baking with me. It jammed on the first use and caused great distress for her! Ended up going back to ol' trusty electric whisk! Sorry cold here also the whisk lasted about one use before it jammed up. You can get a cheap electric budget hand whisk for around a fiver. Unless you're planning to whip up a meringue whilst camping in a field, or training for a whisking endurance competition then its hardly worth it in my opinion. Might lose a few ounces in weight though from the energy lost, but probably put it back on later if you're whisking a cake mix. We always use a normal fork.